When the terrorist attacks of September 11, 2001 took place, the last thing anyone wanted to think about was sports. At Sports Illustrated, which had just closed its newest issue the night before, even managing editor Bill Colson, who lived in Manhattan, wondered if the magazine should go ahead with its next issue. It didn't take long, though, to decide that SI would indeed publish its Sept. 24 issue. How to do it, though, with no games being played that week and no planes flying that could get writers and photographers around the country, became a logistical, if understandable, problem. The result was an issue that remains one of Colson's proudest during his six-year run as ME. SI.com associate editor Ted Keith spoke to him about that week and how his magazine responded to tragedy with one of its most triumphant performances during a year in which it would be nominated for a General Excellence award by the American Society of Magazine Editors, the industry's highest honor. SI: Where were you when you found out what had happened? COLSON: It happened on a Tuesday, which was a day off for us. I was at home and I hadn’t turned on the television. My wife, who had worked at SI for 13 years and had left to go to People, was at the Time & Life Building. She called me and said, "Turn the TV on, look what’s happened." You're just shell-shocked, being in Manhattan. The first thing was, is everybody's friends and family OK? Everybody seemed to be good. SI: Even given various advertising and circulation commitments, was the possibility of not publishing an issue that week discussed? COLSON: Well, my next thought was, do we even have to have an issue? Is there any way we could put out an issue dealing with sports that wouldn’t seem trivial or trite? That’s what we wrestled with, or at least I did. But then like SI people always do, we started getting ideas and writers starting coming with ideas and it became obvious that we do have something to add to the discussion. But you’re absolutely right, it was a possibility. We used to work Thursday through Monday and then have Tuesday and Wednesday off. It happened on a Tuesday, which was like a Saturday morning for us. ​You're always on the phone anyway Tuesday and Wednesday with your executive editor and your photo editor, and that week it was, logistically, what can you do? Can we get flights? Can anybody move? But once we knew everybody was fine, they were all ready to go. Every Thursday morning we had our usual edit meeting that was about what we were going to do for the upcoming week, and I remember going to the meeting that Thursday morning and asking, "Is everybody here, everybody safe?" I never heard of anybody in the SI family at the moment who was affected. Thankfully that’s not a problem we had to deal with. SI: Given that this was a staff of people living in the New York area, was there opposition on the staff to doing the issue? COLSON: We talked about it as a staff and they were supportive of going ahead. I could see how people might have [been resistant], but I don’t remember any of that, though that doesn’t mean it didn’t happen. It might not have gotten to me. It was a fantastic team effort, everybody pitched in even more than we do normally. I talked to Norman Pearlstine, who was my boss as the Editor-in-Chief of the company at the time, and we batted it around and probably let it go for a day or two before we came up with a decision. We decided we would go ahead. ​SI: In looking through that issue, clearly you had to scrap whatever had been planned for that week and do a completely new issue. How did you do that? COLSON: It was exhilarating. When you think about it, in sports almost everything you cover is scheduled. Something like Ray Rice happens every once in awhile out of the blue, but 85 percent of what you cover you can plot out: when is the Super Bowl, when is the World Series, etc. Unlike Time magazine where virtually nothing is scheduled. When something big happened like this, everybody on the staff got an extra sort of jolt and you were more exhilarated because you weren’t just covering this week’s games. We had a blank slate, and we never had a blank slate at SI. You always know what you’re going to be doing. It’s this NFL game or this basketball game. It was starting at an absolutely blank slate. It was big. You also knew there weren’t many times that we would be part of the national discussion that wasn’t normally about sports. We had the New York Times and Time magazine covering the same story we were, so it was a big challenge for us. But that made it exciting. SI: There are pieces from New York and Washington, stories about victims and the decisions not to play games that week, essays on what happened and how it affected sports. How did you decide what stories to do given the hurdles? COLSON: Once we decided we had something worthwhile to add to the discussion, [the issue] just was worth doing. Is it appropriate to even talk about it in the lens of sports? ​Can you fill a magazine with enough meaningful material that’s through the lens of sports? The answers to both of those were yes. Everybody started saying, I can do this, I can find this out. All these reporting instincts come alive in the first 24 hours and you’re getting all kinds of ideas. The writers found these people. When you come to the office they bring this stuff to you because they’re out on the ground. Like that Jack McCallum-Jon Wertheim piece [about children's sports in New York right after the attacks]. Scott Price lived in Washington D.C. and wrote from there [about the Pentagon attack and how it affected athletes in that area]. We had people sending us files all over the place. SI: The issue was almost 100 pages. Was there any thought about just doing a much smaller issue? COLSON: It was a full issue. We had no trouble filling it. Once we gave everybody the go ahead, the stories came. I think people liked spreading their wings and stretching their muscles in a way they don’t usually get to do. Touching on societal issues wasn’t new for Sports Illustrated, but this was far beyond something like that. This was something no one had ever dealt with before. Then they just wrote the way they always wrote. Tim Layden sees football games all the time and now he’s doing something about a Patriots player [Joe Andruzzi] who has [three] brothers who were [New York City] firemen. SI: There was a lot of talk and fear in those early days about another attack.​ Was there a back-up plan if something else had happened? COLSON: I never had to think about it. If something else had happened on Sunday night I have no idea what else what we would have done. Once we decided and I talked to [Peralstine] and said, "We have a good issue here," he was all for it. It took us 24 hours, I’m guessing, to decide that we had the makings of what could be a good issue. 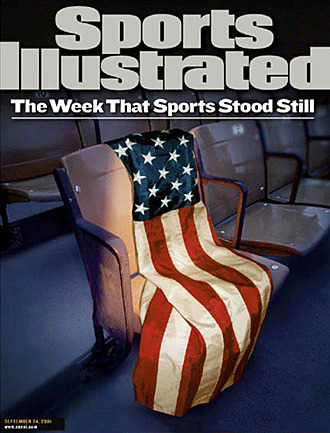 SI: The cover is still one of the most memorable SI ever produced. What do you remember about that? COLSON: That was the American flag draped over a stadium seat, right? I’m sure we talked about it with the art director and the photo people. I can’t remember if it was the slam dunk cover or if there were any pictures we thought seriously about doing instead of that. I just remember it was very satisfying. SI: Do you ever look at it now? COLSON: No, I don't even have it. SI: Does it hold a special place for you then, or was it just another issue? COLSON: Oh, it’s not just another issue. Because I live in New York, I was in New York when it happened, it affects you sort of viscerally. I was on the Upper East Side but I remember going outside to Central Park that day and just seeing these streams of people with dirt all over them walking up to the Upper East Side and Harlem and farther, to get home. When you see that, emotionally it affected me more than any other issue. Not just because I was here but it’s the only issue we ever stated with zero. You usually know two or three things you’re going to do, it’s in the works, and if it's a bonus story you might have even closed it. All you’re doing is news breaks and you ditch one story if you have to and you put in another one. That was the most satisfying and exhilarating issue we ever put out, because of what it meant. SI: Was it back to business as usual the next week? COLSON: We had stayed open that week to get a photo of the [Mets'] first game back [which was Monday, Sept. 17 in Pittsburgh]. The next week, though, there were regularly scheduled games again and there was more about everybody coming back: What’s your NFL game, what’s your college game? There were follow stories, too. I remember going to [Game 4] of that World Series, and boy that was moving. I sat next to a firefighter’s wife and one of their kids. It was hard not to cry through that game, the one where Tino Martinez hit the [game-tying] home run for the Yankees. But we knew this event was going to change our lives forever. It wasn’t, How big is this going to get? It was huge at the time and there's no question we were going to keep covering it. We were a newsmagazine, we're not just about games. SI: What are your takeaways from the issue?